Suriya in Anjaan has created enough frenzy and the cherry to the cake is the recently released 2 minute 34 seconds official theatrical trailer. 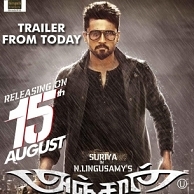 Starting with the very same dialogue about the eagle, Anjaan trailer is sleek and stylish. Apart from introducing the title card, cast and crew, this trailer does offer something about the possible story as well. The trailer itself tells a story starting from the physically challenged brother of Raju Bhai, Krishna, who is going in search of him. Yuvan needs special mention for his experiments with the background score, specially when Suriya talks to Samantha about the love factor. The quality of the trailer is directly proportional to the incoming crowd for a film. Anjaan is high on action, comedy and love. There is said to be a tale of revenge interwoven around an underworld don. Suriya and Samantha are at their best looks comprehended by ace cinematographer Santosh Sivan. Vidyut, Parotta Soori and a list of actors have apparently been given equal space to perform their roles. Thanks to Anthony Gonsalves, the trailer is apt and perfect. Lingusamy is eyeing another blockbuster here. After A.R.Rahman, Anirudh gets ticked! Vishnuvardhan's next to continue from the mid of August ! Samantha Is Pissed Off By A Popular Media House’s Accusation That She Copies Fashion. People looking for online information on Anjaan trailer, N Linguswamy, Parotta Soori, Samantha, Santhosh Sivan, Suriya, Vidyut Jammwal will find this news story useful.